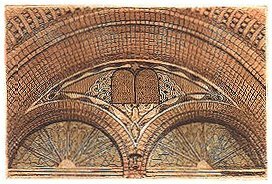 The little Leo Baeck Synagogue (architect Hans Wolff Grohmann) with its 130 seats was inaugurated in 1981 and contains objects from a prayer room in the pre-war old aged people’s home situated at Iranische Strasse. The building is part of the complex of Leo Baeck Old People’s Home and Jeanette Wolff Senior Center. Leo Baeck (1873-1959) came to Berlin in 1912 and worked here as rabbi. He survived the Theresienstadt concentration camp and lived in London until his death. Jeanette Wolff (1888-1979), a Holocaust survivor, was active in the Berlin House of Representatives (Berliner Abgeordnetenhaus) and later in the German Parliament (Bundestag). In 1903-1904 it was built by Johann Hoeniger with 2000 seats. It is situated in a court yard and remained undamaged. 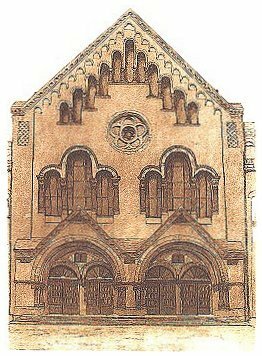 Originally a Reform Synagogue with organ, choir loft and mixed seating, this practice is no longer followed. In 1940, the building was confiscated and used as an army store. 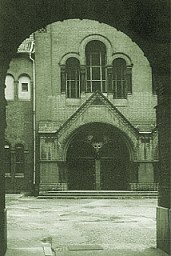 In 1953 it was renovated (further renovations in 1987) and served the small East Berlin Congregation for many years.